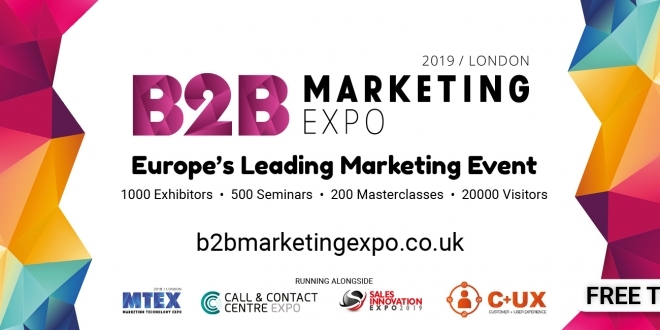 Join thousands of like-minded industry elites, on the 27th & 28th March at London’s ExCel, for the 2019 instalment of the B2B Marketing Expo, Europe’s ultimate marketing event! Featuring the return of our innovative Marketing Technology zone (MTEX), this is your portal into the future of the marketing industry, whether you’re business or consumer focused! Network face to face with the world’s leading marketing suppliers! From Linkedin, Google, Amazon, Microsoft, chiefmartec.com, the DMA and hundreds more! The best part? Tickets are completely free! Head over to the website or grab your FREE ticket now because this is THE place to be! As one of our official partners for the 2019 show, we are delighted to announce that we will be offering BCMA members a £50 per sqm discount to exhibit at the B2B Marketing Expo 2019!